Whew, I just dropped off the Speedo Mandala Clock at the Play Berkeley Digital Media Conference. there was a little debacle over the display case, and I ended up buying an acrylic one at Tap Plastics at the last minute. What a beautiful campus! I've never really explored UC Berkeley before, and it looks lovely. 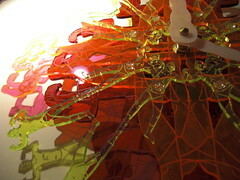 Woohoo, my Speedo Mandala Clock was chosen to be shown at the Play Berkeley Digital Media Conference this weekend! The conference is at the Haas School of Business at the University of California at Berkeley. It will feature Wired's editor-in-chief, Pixar Animation Studios, and more. I've been wanting a tabletop photography kit for a while, to take decent pictures of my 3-D printing experiments, as well as other projects. After reading endless Amazon reviews, none of the kits seemed like the perfect choice. I finally settled on the 30" universal photography kit by EZcube. The cheaper kits sounded like they would have weaker, flimsier lights. The EZcube itself is pretty interesting — 30" x 30," and folds up to the size of a small pizza, for storage. So it's very compact. But actually getting it folded is like making a particularly difficult origami model. After multiple attempts,I've finally got the hang of it. As a (very) novice photographer, the lights seem decent and sturdy, though they could be brighter. The backdrop is wrinkly when unfolded, and the wrinkles show up in the photos. I followed the advice of some of the reviewers, and put a piece of white paperboard into the tent to shoot against, instead of the backdrop. This worked much better. Also, the kit could use a storage case. I was shooting some pictures of my Speedo Clock (which I'm now calling Speedo Mandala Clock), to submit to a call for entries for an art show. They turned out alright — the main benefit of the tent seems to be to diffuse the light, making the shadows less severe. I'm just using a point and shoot camera — a couple-year-old Casio Exilim. Annoyingly, when the center of the clock is in focus, the outsides are out of focus. I've tried a couple of different modes to try and fix this, but they haven't made a difference. At least I got good enough photos to enter this competition with. I'll have to revisit this focus issue though. 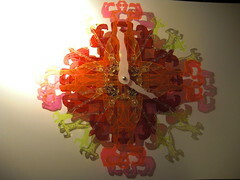 Last year, I designed this clock, cut out of acrylic with the laser cutter. It's comprised of shapes created by layering an image of a guy wearing a Speedo, and creates kind of an abstract, baroque form. I was really excited about the way it came together, and was looking forward to further experiments with patterns created from body shapes, and the way the clear acrylic interacts with light. Unfortunately, the fumes from cutting plastic made me really sick, and I was out of commission for quite a while. This was a real disappointment, as I had lots of other acrylic projects in the hopper. Recently, I changed direction with some new ideas, and started cutting some paperboard for another project. Unfortunately, the fumes from other people's projects (others cut plastics in the same facility) made me a little sick when I went in. I'm not really sure what to do next, as I work pretty iteratively, so mail order laser stuff seems like it wouldn't work as well for my projects.